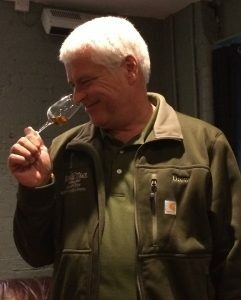 One of our highlights of late 2017 was hosting Drew Mayville, the Master Blender for Buffalo Trace Distillery.He gave a series of masterclasses and tastings. Mr Mayville is in high demand, so we are proud to have been one of only three bars in the UK selected to host him during his visit. His other stops were in London and Edinburgh. 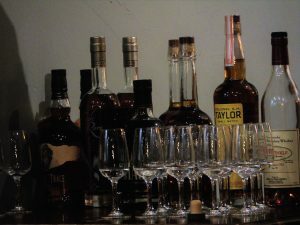 We enjoyed an industry only masterclass in the afternoon and then invited the public to join us for a tasting in the evening. A fantastic day was had by all. Keep an eye out on our social media pages and What’s On guide for more exciting events coming up in 2018. We kept a little note of our thoughts during the industry tasting session. We have an ever changing range of Buffalo Trace products available on our bar, as we love their quality and style. Ask your bartender if you are interesting in trying something new. Made to educate about the range of flavours you can find within a new made bourbon spirit before aging. This spirit is 125 proof, and gives an incredible pepper kick – it is Buffalo Trace as it is when it goes in to the barrel, the raw distillate. However, it does still have a slight sweetness in the mouth from the corn, balanced by the rye as the small grain. You’ll either love it or hate it depending on how experimental you are with your flavours. The one you’re all familiar with and always on our bar. Light straw coloured and a sweet nose for this 8 (plus) year aged bourbon. It has interesting spice on the tip of the tongue. The dryness of the oak hits the centre of the mouth and then hints of vanilla fudge comes through. An incredibly balanced and extremely pleasant drink. A 10 years aged bourbon, helping guests to learn about the developing impact of the oaking process on the dryness and the finish of the drink. It had more complex dimensions on the nose. The spice from the oak is intense and has started to create some notes of dried fruit. It gained many nods of approval in the room. Eight years aged and strong on the nose with apricot notes. This is an explosion of heat and spice in your mouth, but surprisingly smooth. Lovely fruit flavours are layered with black pepper and twiggy notes from the barrels! It has a dry tannic feel but yet leaves a syrupy coating in the mouth. This is the fatty acids in the spirit coming through, which are the reason it is left as a high proof – a cut version would cloud. It has a joyous, rounded finish with some very light vanilla coming through in the finish. With 51% rye and corn as the small grain, this cannot be called a bourbon. It has a smooth nose with the spice leaning towards the clove end of the spectrum. It’s a delight of smoothness in the mouth. There is some vanilla while also being fruity, almost peachy and just the merest hint of spice. This is 100 proof and aged for around 7 years. Its beautiful amber colour and large halo were reflected in the very light, delicate nose. It gives an elegant spice hit just on the roof of the mouth. We enjoyed its airy fruitiness. There is no intense oak or tannin here and as a result it is complex, light and ever so slightly floral. Lip smacking.